Shih Tzus and Lhasa Apsos are two dog breeds that look similar with their coats of hair and relatively small size. To the untrained, it’s easy to confuse one for the other, and it’s this article’s objective to highlight the differences between these adorable dogs. A Shih Tzu is a toy dog breed known to have originated from Tibet, then developed in China, where it is also called the Chrysanthemum Dog or the Chinese Lion Dog. Usually standing no higher than 28 centimeters or 11 inches, a Shih Tzu typically weighs anywhere between 4.5 to 8.6 kilograms, or 10 to 19 pounds. A Shih Tzu has a short muzzle, bulging, dark eyes, and hair-covered drop ears. Its soft, silky and long double-coat is usually white in color with streaks of grey, but it may also come in any colors. One distinct feature of this breed is its underbite. The Shih Tzu’s traditional long coat grows all the way down to the floor and requires regular grooming to avoid tangles. This makes this dog breed rather expensive to maintain. It is common practice to clip the coat short for convenience and practicality. It’s normal for Shih Tzus to have varying temperaments, but they are well-known for being loyal, loving, alert and friendly pets. A Shih Tzu can be stubborn at times, so it’s usually a good idea to train the dog at an earlier age. Although a bit stubborn at times, the Shih Tzu is an active and extremely friendly dog. 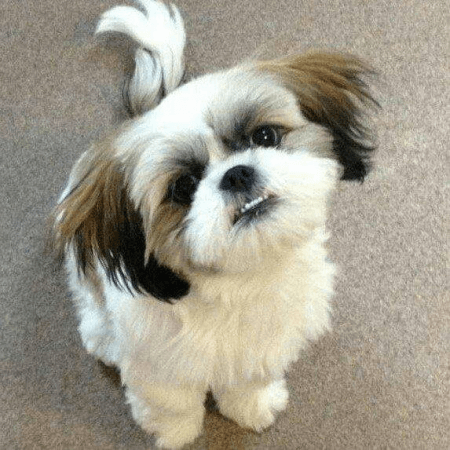 This friendly disposition allows the Shih Tzu to mix with other dogs, children and adults alike. A perfect specimen of the Lhasa Apso. The Lhasa Apso was originally a watchdog both bred and trained as trusty sentinels in the Buddhist temples of Tibet. It has dark brown eyes and a black nose. 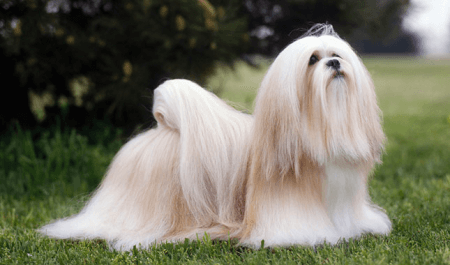 The Lhasa Apso sports a heavy, straight, and dense coat of various colors such as black, red, white or gold and in varying shades. These dogs usually weigh from 12 to 14 pounds, or 5.4 to 6.4 kilograms. While some Lhasas have dark-tipped ears and beards, other Lhasas don’t. The dog’s tail should be carried well over its back. The Lhasa’s muzzle is set low on its face; its bite is leveled or sometimes a bit undershot. Its head is narrow and not domed. The Lhasa Apso were bred and trained to serve as guard dogs in Tibetan Buddhist temples, and as such, the dogs are alert with a sharp sense of hearing. It is a happy and confident breed, but the Lhasa’s long history of being a sentinel has made it careful and watchful of strangers. It is also very smart, capable of strong judgement and restraint. If it sees its owner welcoming a stranger, it will also do the same. So what’s the difference between a Shih Tzu and a Lhasa Apso? As both dog breeds are known to have originated from Tibet, they share a few similarities, such as the long coat and the relatively small size. However, a Shih Tzu is a different dog breed with a slightly wavy coat compared to the Lhasa’s straight coat. The Shih Tzu was raised as a pet, while the Lhasa was trained to be an effective guard dog. A Shih Tzu’s head hair is often tied, sometimes into a knot; a Lhasa’s hair is parted right down the middle and left to fall at the side. Shih Tzus were raised as pets, and are very affectionate towards other dogs and humans. Lhasas were reared as indoor watchdogs and are observant and wary of newcomers.